Raw Nutiva Protein Powder - Great For Smoothies! I like their environmentally friendly packaging option. Now that the weather is finally warming up, I start almost every day with a raw smoothie. For me, it becomes a chemistry experiment, adding a little flaxseed oil for omega 3, a little VitaMineral Green, fresh or frozen raw fruits, a handful of greens, some organic hemp or soymilk (or raw nut milk), topping it off with the contents of a calcium/magnesium capsule. I recently came across an organic, raw protein powder by Nutiva. They have two kinds. One is Hemp Protein with Fiber (with a profile of 37% protein, 43% fiber and 10% healthy fats including omega 3, 6 and 9). The other product is Hemp Protein 50% (with 50% protein, only 20% fiber and 11% fat). I find that by adding a few tablespoons of this protein to a smoothie, I’m pretty satisfied until lunchtime. It also is a perfect thickening agent and makes any smoothie thick and creamy. 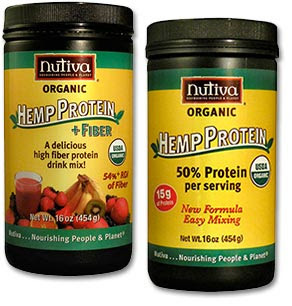 Hemp protein contains 66% edestin, a highly digestible bioactive plant protein. It is a “complete” protein and contains all the essential amino acids. This product is also gluten, dairy and lactose free. You can try adding a few tablespoons to any of my smoothie recipes. If they get too thick, just add some additional cold water. 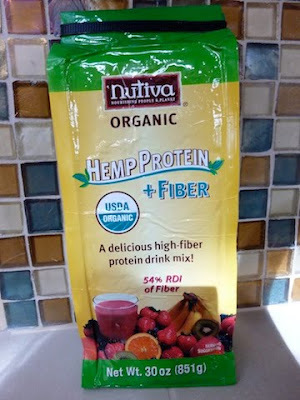 Nutiva also makes their own Hemp Shakes. I prefer to mix up my own since I can control the sugar content, but I've tried theirs and most of them have a pretty low sugar content and are quite delicious. They come in Amazon Acai, Berry Pomegranate and Chocolate. Start your day with a simple, raw breakfast salad. 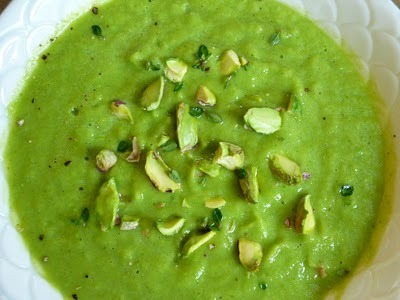 For lunch try creamy raw zucchini soup with crushed pistachios. 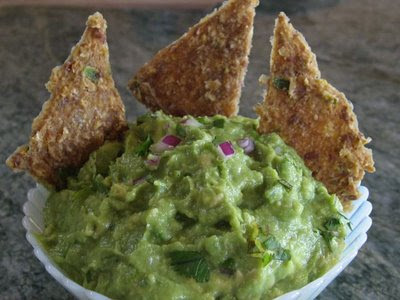 Snack on guacamole and raw jalapeno corn chips. 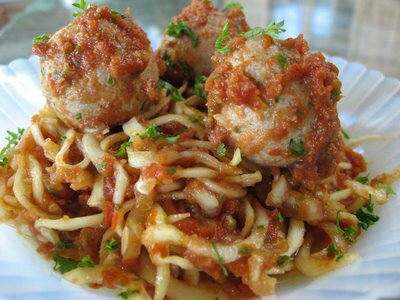 Zucchini spaghetti and walnut meatballs make a hearty dinner. 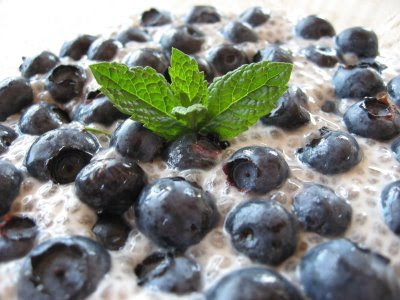 Chia pudding and fresh fruit make a nourishing dessert. When my iris are in bloom, and the weather starts to get warm, I feel like cleaning. There's something about this time of year that makes us clean out the garage, spray wash the driveway and spruce up our yards. The most important thing to cleanse, of course, is our body. After a winter of eating comfort foods and lower activity levels, a gentle body cleanse is a great way to get ready for summer. Why Cleanse with Raw Food? There are different ways people cleanse their bodies. Some go on a juice or water fast, some do it with the help of herbal supplements, others with colonic irrigation or other techniques. Each have some drawbacks. Fasting is hard, especially for me. When I skip a meal my blood sugar drops, I get dizzy and unfocused and extremely grumpy! My husband and children will surely attest to that. Fasting for anyone can trigger severe detoxification reactions and should be done with the help and presence of a knowledgeable practitioner. Herbal supplements can contain numerous ingredients and most people take them without a good understanding of what's in them. Looking at some of the more common herbal cleansing formulas on the market, I see a mixture of over 50 herbs. As you know, herbs can be strong medicine and combining that many of them is a bit worrisome for me. Many people find colonic irrigation unpleasant and I certainly don't have to explain that. It is recommended by many experts, especially when undergoing severe detox from from chemotherapy or a lifetime of poor eating habits. This can certainly be done in conjunction with a raw food cleanse. * Eating mostly organic raw food for a period of time gives your body a break from adding to its toxic load. * The high fiber of whole, raw foods is cleansing. * The enzymes contained in raw foods help in their own digestion. This allows your body to spend the energy usually spent generating enzymes on doing other things, like healing and rebuilding. * The numerous antioxidants and phytochemicals in raw fruits, nuts, grains and vegetables have the ability to prevent and combat many diseases. * Eating and preparing meals from foods in their most natural state (versus eating processed foods out of a box) rebuilds a connection between you and the earth. * A raw food diet allows many options for accomplishing these health benefits while enjoying delicious food. Anyone who wants to improve their general health would benefit from eating a mostly raw food diet for a week, two weeks, three weeks or a month or more. Some people exclusively eat a raw food vegan diet but I believe you can achieve many of the health benefits of this food regimen without being 100% raw. (Read "Raw Food Diet - How Raw Do You Need To Be?"). If you are trying to lose weight, lower your cholesterol and triglycerides, prevent type 2 diabetes, improve your energy level, detoxify your body, get rid of heartburn or other gastrointestinal disorders, lighten your mood, or just improve your general health, you may want to try a raw food cleanse. Even if you can only do it for 10 or 20 days, you will see improvements. See how my friend Kannan significantly improved his health when he ate mostly raw food for 41 days. When it starts to warm up in the spring, I eat at least half of my food raw and by summer, when my garden is flourishing, I eat around 70%. But once a year, sometime between May and July, I go on Raw Food Cleanse and I eat at least 90% raw food for one month. When I feel like eating a bit of cooked food, I eat brown rice, or a steamed grain. For the next month eat mostly all raw food. I've listed some favorite raw food vegan recipes below for each meal of the day but there are many other raw food recipes on this blog in addition to those listed. If you are really craving some cooked food throughout this cleanse (especially in the beginning), eat some brown rice. If you eat a cooked meal for whatever reason, don't worry, just get back to raw food with the next meal. This will not feel like a diet or fast. It will just seem like you are eating delicious, fresh, natural food. Raw Apple, Pear and Fig Green Smoothie. 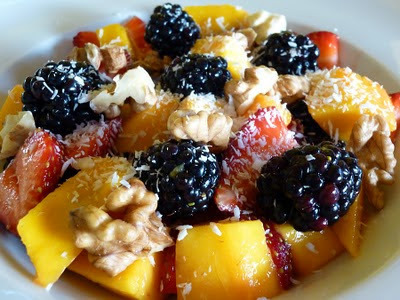 Blackberry, Strawberry and Mango Breakfast Salad. Raw Granola with Fortified Raw Almond Milk. Note that whenever a recipe calls for hemp milk or soy milk (which are not raw), you can always substitute any raw nut milk of your choice. I'll combine these two meals since many of the recipes can be eaten for either meal. Raw Dessert Helper as a Crumble or a Crust. Depending on how much processed food you consume in your present diet, you may experience symptoms of mild detoxification. You might get a headache. Or, if you are not used to eating much fiber, you may get an upset stomach or experience some gas. Be sure to drink plenty of fresh water and eat some cooked brown rice to help settle your stomach. These will pass after a few days. If you know anyone who really needs to take a first step to improve his or her health, pass this along. If you know anyone who is curious about raw food or is just starting to eat a raw food vegan diet and would like some good recipes, pass this along. If you know anyone who is battling obesity, high cholesterol, type 2 diabetes, heartburn, depression, fatigue, and many other health issues, pass this along. It is always wise to inform your doctor before you begin any new dietary program. Start with thin skinned, red or yellow new potatoes. Drain "small diced" potatoes after boiling a short time. For a creamier texture, gently stir in half a diced avocado. Most people love this comfort food. In fact, it is the highest produced vegetable in the world! However, there is a lot of guilt involved with its consumption, mostly because it is often eaten fried as chips or french fries or as a butter, cheese and sour cream laden baked potato. But actually, the potato is a pretty healthful food, high in fiber, vitamin C, vitamin B6, potassium and manganese. One large potato provides over 100% of your daily requirement of vitamin C and 1/3 of your fiber needs. Potatoes are also low in calories, fat free and contain phytonutrients that provide protection against heart disease and cancer. Being raised in an Italian home, I didn't grow up on the typical American diet. I didn't even know potato salad could be made with mayonnaise and eggs until I moved to Texas to attend college. My dad always made potato salad with a simple lemon and oil dressing and some fresh parsley. Instead of mayonnaise and eggs that make this popular salad heavy and high in cholesterol, the lemon makes the salad taste light and fresh. In today's recipe, I add some inflammation reducing, cancer fighting turmeric which gives the potato salad the color of an egg potato salad without the egg. If you miss the creamy texture from mayonnaise, add the avocado. Besides the creamy texture, you'll get a good dose of fiber, vitamin K and folate, and of course the delicious flavor of avocado! * Cook in a large pot (like a 5 quart Dutch oven), so the potatoes are spread out, and just barely cover them with salted water. * Boil them for a short time - this will depend on how small you dice them but taste them after 5 minutes. I usually boil them for about 6 minutes or I shut them off at 5 minutes and let them sit in the pot for another few minutes until they are just fork tender. * Drain - no need to rinse. Place potatoes in a 5 quart Dutch oven, add water to just cover the potatoes and stir in salt. Bring to boil and cook for 5 to 7 minutes or until they are just "fork tender". Taste after 5 minutes and DO NOT overcook. Drain and let sit until they cool a bit. To make the dressing, combine the lemon juice, olive oil and turmeric and blend well with a fork. Set aside. In a large bowl, combine the drained potatoes, celery and red onion. Mix in the dressing and gently stir in the avocado and parsley. Add additional salt if needed and top with freshly ground black pepper. Per serving without avocado: 123.2 calories, 4.7 g fat, 0.7 g saturated fat, 0 mg cholesterol, 2.8 g protein, 20.2 g carbohydrates and 3.0 g of fiber. Per serving with avocado: 142.2 calories, 6.4 g fat, 0.9 g saturated fat, 0 g cholesterol, 3.1 g protein, 21.2 g carbohydrates and 3.8 g of fiber. Green tea contains catechins, powerful antioxidants that have a role reducing free radical damage which can lead to cancer and heart disease. Because green tea receives minimal processing, its catechins are very concentrated, especially their unique catechin, epigallocatechin-3-gallate (EGCG). In the laboratory, EGCG has been shown to inhibit cancer cell growth. Some human studies have shown a link between increased green tea consumption and lower recurrence of breast cancer after surgery and a lower risk of developing stomach, esophageal, prostate, pancreatic, lung and colorectal cancers. Other human studies showed a correlation between green tea consumption and reduced risk of heart disease. Besides just making a cup of tea, there are other ways to receive the health benefits of tea. Try adding green tea to soups or using green tea as the liquid in your morning smoothie. There is some caffeine in green tea so be sure not to drink it or cook with it too late in the day or it may disturb your ability to sleep. However the amount of caffeine in an 8 oz. cup of tea is only around 20 mg compared to 60 to 120 mg in brewed coffee or 40 to 50 mg in black tea. By far, the best green tea is from Japan. It's sounds obvious, but green tea should actually be green! So many of the large corporate tea companies make green tea products that don't look or taste anything like real, Japanese green tea. You can buy genuine green tea online from Den's Tea company. You can buy loose tea or these very cute and convenient pyramid tea bags. My favorite is the Pyramid Tea Bag Sencha. Here's a smoothie recipe that provides all the advantages of green tea, chia seeds and fresh fruit. In the morning, place the chilled green tea, chia pudding, banana, strawberries, ice and optional sweetener in a VitaMix, blend and serve immediately. Per serving: 190 calories, 8.0 g fat, 1.5 g saturated fat, 0 mg cholesterol, 4.5 g protein, 37.8 g carbohydrates, 9.8 g fiber, 3.6 g omega 3 and 2.9 g omega 6 fatty acids. It's funny how new recipes get developed. The other day I was cleaning my refrigerator (a rare occurrence) and I came across some organic wheat berries in a brown paper bag. These were evidently left over from my Hearty Vegan Bean Chili with Wheat Berries recipe I posted in February. I realized that it was unlikely that I would ever think of cooking these unless they were more "visible" so I put them in a large glass jar. Unfortunately, the jar wasn't big enough so I had an extra cup of wheat berries on my hands. So I soaked them overnight which gave me some time to figure out what to do with them. The next morning I cooked them up and set them aside and headed out to the market to look for other ingredients. I found some beautiful fresh asparagus and some other veggies which all ended up in this dish. Other than the time it takes to cook wheat berries, the dish cooks up in minutes. You can always cook wheat berries in advance and freeze them for use later. But you'd better put them in a glass jar or who knows how long they will stay in your refrigerator before you notice that they are there! If you don't have the time to make wheat berries, substitute orzo pasta, couscous, quinoa or brown rice for the wheat berries. After soaking the wheat berries overnight, rinse them well and cook in 3 1/2 cups of water and 1/2 to 1 teaspoon of sea salt. After bringing to a boil, lower the heat, cover and simmer for 1 1/2 hours or until they reach the desired texture. Drain and set aside. Heat oil in a not stick 5 quart dutch oven. Sauté the mushrooms until they release liquid, stirring continually for several minutes. Add red bell pepper, scallions and asparagus and cook for a few minutes until the veggies are "crisp tender". Add soy sauce and wheat berries and stir until heated. Shut off the heat, stir in the lemon juice, top with freshly ground black pepper and serve. Per serving: 118.2 calories, 2.0 g fat, 0.3 g saturated fat, 0 mg cholesterol, 4.0 g protein, 12.8 g carbohydrates and 2.8 g of fiber. Having lived in Texas for so many years, pralines became a favorite sinful treat. They were always the finale of a wonderful Tex Mex meal. I still can't walk through the Dallas airport without being drawn to the Lammes Candy stand, a company that makes pretty awesome pralines. But knowing what's in them, it's become impossible to indulge. Most pralines are made from granulated sugar, corn syrup, butter and cream - not exactly the food groups I endorse. So I took a shot at duplicating the flavor with simple, guilt-free vegan ingredients - just good old raw Texas Pecans, medjool dates, and a little sea salt and vanilla extract. Although pecans are high in fat, it's the good kind. They are high in oleic acid which is the same fatty acid found in olive oil, one of the mainstays of the healthful Mediterranean diet. They are a bit of a challenge to "hold together" but I find refrigerating them for a few hours really does the trick. Place the cup of pecans, the medjool dates, salt and vanilla extract in a food processor with an S blade and process until the mixture sticks together. Place the processed pecan mixture into a bowl and mix in the 2 tablespoons of chopped pecans. Form into 12 small patties and press one whole pecan half into each patty. Place on a flat plate covered with wax paper and refrigerate for 4 hours or more. Serve chilled. Per praline: 107.4 calories, 7.7 g fat, 0.7 g saturated fat, 0 mg cholesterol, 1.0 g protein, 10.5 g carbohydrate and 2.1 g of fiber.